I read so much Tudor era fiction, but until I picked up The Tudor Bride I hadn't yet read a story that centers on the dynasty's origins. I hadn't realized, either, when I picked this book that's it sequel, but I feel it stands alone, and I knew enough of the history to follow along to certain references. The Tudor Bride is the story of Catherine of Valois, who married Henry V but sadly became a widow too soon into their marriage. Her French heritage and potential influence on the young Henry VI keep her from court, and while it's expected for queen dowagers to live out their years like nuns Catherine is still vital and of a marriageable (and child-bearing) age. Of course, in this age of suspicion and ambition among any number of people who could claim the throne, the idea of a vulnerable boy king inspires temptation in court. Though Catherine isn't close to her son, her determination to protect him (from dubious advisers and her brother in France) remains strong while she hides her union with Owen Tudor. Catherine's story is told through the POV of her faithful Mette, her mistress of the robes during Henry V's regency and later a confidante. I find sometimes that stories told in this bystander POV take away from the main characters. We never really get into Catherine's head but we understand Mette's devotion to her. Her narrative seeks to protect her as she's done for all the queen's life. 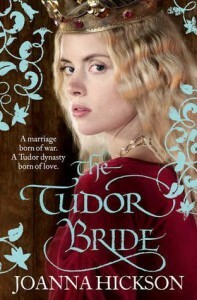 I enjoyed the story and as a result may seek out the preceding book, The Agincourt Bride, when I have time.